Intent matters and is the only thing that matters in the long run. Perceptions of people may act as stumbling blocks but if you are doing any task with clear and good intention then these temporary challenges should not matter at all. Let me take one example of an intention that almost every one of us will have. It is about making money and securing our future. Is it good or bad to have an intention like this? I would say it depends from person to person. Even a thief will have an intention like this. So, a good intent will also be one that ensures that the foundation of your success is not laid on the losses of others. A win win situation for all is the only way to be happy and stay happy. This does not mean that you part with your hard earned money to help out someone who suffered losses because of his or her own foolish ways. Only thing I wanted to communicate is that do not cause losses to others in the pursuit of your goal. Achieving goals means taking right action at the right time. Do not waste time explaining each and every action you take. It will drain you out and make you lose your focus. Before taking any decisive action in life weigh the pros and cons. You will lose something and will gain something in pursuit of your goal. However the satisfaction of achieving what you intended to is far greater than any short term gains or setbacks you suffer. It doesn't matter whether the world stands by you or not. Having the right intent and working steadily towards a goal is the need of the hour. You will always be surrounded with skeptics who neither take any decisive action nor allow you to take one by trying to create doubts in your mind. Do listen to them and analyze but do not let negativity to have any adverse impact. Always keep asking yourself whether I am doing the right thing or not. You will get answers. It may not be instantaneous but you will know whether you are doing the right thing or not. How an Indian voter should vote this election? Before I comment on how an Indian voter should vote let me make it very clear that this is my personal opinion. The ultimate decision about whom to vote for is to be taken by your own free will. However, please do make an informed and responsible decision as each vote counts and it will decide the future of our nation. It is very evident that the real choice to be made is between Congress and the BJP. Aam Admi Party is claiming to be a serious contender but after how they handled Delhi, I feel they are not ready yet. Their inexperience will be disastrous for us. So, I am not considering them for my analysis here. 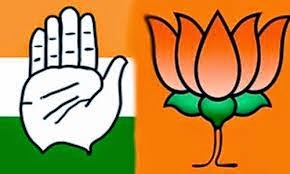 Between BJP and Congress, whom should we vote? To be specific, should we vote for NDA or UPA? If corruption is the deciding factor then please do not think that NDA would be majorly different from UPA. Moreover, corruption thrives because we as society are corrupt and we breed corrupt politicians. If we sell our votes and end up electing a corrupt politician then we should not blame political parties for it. The next factor is about being secular. Is Congress better off here than BJP? If Modi is being blamed for 2002 Gujarat riots then Congress was responsible for 1984 Sikh riots. In fact, I am sure that 1984 was more brutal because media then was not as active when compared to 2002. So, the ground reality of 1984 is not known to many. Now look at how the two political parties are structured. Congress seems to be a family affair since Jawaharlal Nehru's time and the legacy continues till date. BJP on the other hand is not dependent on dynasty. Even though Manmohan Singh is PM and has been the PM for last two terms, even school going kids know that he was not in control at all. Someone else was calling the shots. Maybe Rahul Gandhi would be elected PM if Congress wins this time but after listening to his interview with Arnab Goswami on Times Now news channel, I think his understanding of issues is far from reality. Now compare Narendra Modi with Manmohan Singh or Rahul Gandhi. When Narendra Modi talks we can sense great confidence and courage which feels reassuring. That's how the leader of the nation should be. In Congress too there was a strong leader in Pranab Mukherjee. He too would have been a strong PM candidate and may be that was the reason he was nominated by Congress to be the President of India. Pranab handled External affairs ministry very well. He talked tough with Pakistan. If he would have been in the race for PM, deciding between Modi and him would have been a tough call. We have given the Congress party more than enough chances but they have not justified our faith in them. Hence I feel that we as a nation should give Narendra Modi a chance. Let us see what he can do in the next 5 years. If he doesn't do well let us go back to Congress or maybe choose the Aam Admi Party if they mature by then.